Anthem is getting new cosmetic rewards through items called Elysian Caches soon, and those will include new vinyls, arrival animations, victory poses, and emotes, as noted on the game’s roadmap. However, the caches will pointedly not include new bits of armour. The community is unhappy about that, and the displeasure has only intensified thanks to some poor communication from BioWare. 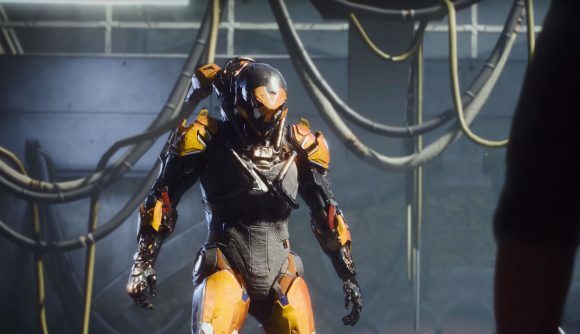 While critical response to the game has been mixed, Anthem sales have apparently been quite good – it’s BioWare’s biggest seller since Mass Effect 3. But now, the players who’ve bought in are left without many satisfying things to accomplish in the endgame – and with reportedly broken power scaling for loot, substantial cosmetics were the next best thing to hope for. When Elysian Caches hit, you’ll get keys from daily challenges, which can then be used to unlock chests at the end of strongholds for bonus vanity rewards. For many players, that’s not enough. One Reddit post calls the chests “an absolute joke,” and adds that “there is no social aspect in this game and not a single reason to use them.” The tone of responses to the addition have broadly been similar. Alongside Anthem patch notes, BioWare has had occasion to speak directly about the community’s many frustrations. Broadly, the message is that “Anthem is here to stay,” and of course it is – it’s a game that’s already seen a massive investment and still has loads of potential. But in the game’s current state, even the smallest of missteps, like the Elysian Caches, are going to be faced with incredible scrutiny.